MicroObservatory is a network of automated telescopes that can be controlled over the Internet. 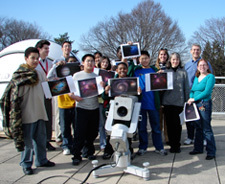 The telescopes were developed by scientists and educators at the Harvard-Smithsonian Center for Astrophysics and were designed to enable youth nationwide to investigate the wonders of the deep sky from their classrooms or after-school centers. They are located and maintained at observatories affiliated with the Center for Astrophysics, including the Harvard College Observatory in Cambridge, MA and the Whipple Observatory in Amado, AZ. The MicroObservatory remote observing network is composed of several 3-foot-tall reflecting telescopes, each of which has a 6-inch mirror to capture the light from distant objects in space. Instead of an eyepiece, the MicroObservatory telescopes focus the collected light onto a CCD detector (an electronic chip like that in a digital camera) that records the image as a picture file with 650 x 500 pixels. This Observing With NASA website is part of a NASA-funded project to make the MicroObservatory robotic telescopes accessible to all audiences who want to appreciate and understand the amazing images and data from NASA's space science missions. Using many of the same technologies that NASA uses to capture astronomical images by controlling telescopes in space, YOU can control a sophisticated ground-based telescope from the convenience of your computer. Users control the MicroObservatory telescopes and download their images themselves, with no human intervention in the loop. 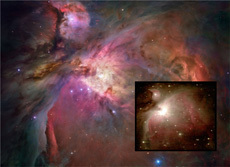 You can access the Observing With NASA "Control Telescope" web interface at anytime. The telescopes are weatherproof and do not require a dome for protection, and the "Control Telescope" software automatically lets users know which targets are up that night. This means that even first-time observers can control the instrument without dependence on a telescope operator or other outside "experts." After you choose your target and select an exposure time, color filters and other parameters, you submit your email address along with your request for the telescope to take the image that night. The next day (or within 48 hours) you will receive an email notification with links to access and download your very OWN image. This site includes the daily image archive of all images taken by all guest observers, as well as additional telescope interfaces including; ExoLab, DIY Planet Search, and "full access" accounts to the telescopes for a limited number of users. A 2018 educational research poster highlighting preliminary results of our YouthAstroNet program featuring MicroObservatory telescopes. A 2006 article reviewing 10 years of lessons learned with MicroObservatory is available through the online journal, Astronomy Education Review. Sadler, P. M., Gould, R., Leiker, P. S., Antonucci, P., Kimberk, R., Deutsch, F., & Hoffman, B. 2001, "MicroObservatory Net: A Network of Automated Remote Telescopes Dedicated to Educational Use," Journal of Science Education and Technology, 10(1), 39.